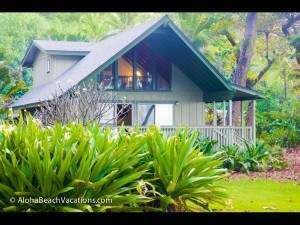 Located on the shores of Kealakekua Bay, a Protected Marine Conservation area, is an enchanting, 3 bedroom/3 bath, oceanfront house that is open and airy. This private home has all the amenities one would desire for a tropical vacation. 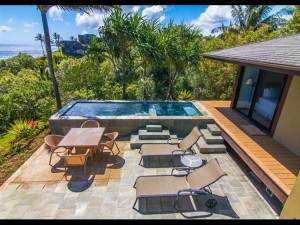 The property is surrounded by fragrant plumeria trees and coco palms and includes a sun deck, hot tub and outdoor shower. You can enjoy your dinners watching the famous Kona Sunsets on the spacious lanai, which can seat 8 comfortably. The home has wireless Internet service, High Definition TV and an iPod compatible entertainment system. 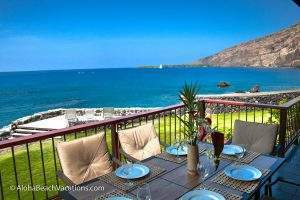 The upstairs features open air kitchen and great room with panoramic views of Kealakekua Bay. The entire wall of louvre sliders open to invite the oceanviews in. The dining area is situated on the covered lanai. The Master suite opens to the balcony lanai to allow you to wake to the sounds of the ocean. Second bedroom features 2 twins with private bathroom. The third bedroom, located on ground level, has it’s own entrance, kitchen, bathroom and sitting area. It has a King size bed with sliding door to allow access to Hot Tub a few steps away. Ammenities	Entertainment Hot Tub : Surrounded by lush Areca Palms CD DVD Stereo System Satellite Or Cable Full Kitchen 2 Microwaves Dishwasher Cooking Utensils Ice Maker 2 Refrigerators Outdoor Features Lanai : Overlooks Kealakekua Bay with its many unforgettable sunsets Deck/Patio Gas/Electric BBQ Grill Outdoor Grill Charcoal Oceanfront : Easy access to Kealakekua Bay for swimming and kayaking Telephone Wireless Broadband Activities Fishing Hiking Shelling Surfing Cycling Swimming Wind-Surfing Mountain Biking Golf Sightseeing Boating Snorkeling/Diving Shopping Wildlife Viewing Kayaking Restaurants Wild Spinner Dolphins frequent the Bay and offer opportunities for observation and interaction.